News: RF Generation: Burgers from trash cans taste the best. Yeah Rocky and Bullwinkle is far from a hidden gem, thanks for taking that one down for us. 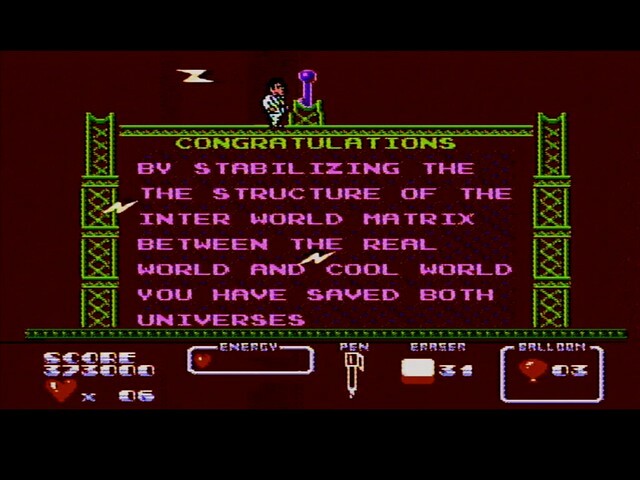 I also took down a game that wasn't so great tonight and beat Cool World. Not much to say about this one. It doesn't do anything very outstanding. Just the very definition of mediocre. And it's got some pretty frustrating hit detection. @Fokakis79 - Glad to hear your making progress in both your games, very awesome! @bombatomba - It's pretty interesting that there are 4 AD&D games on the system and none of them resemble each other. I'm going to be starting Pool of Radiance tomorrow. I'm coming up on a big milestone for myself so I was saving it to hit that goal with a special title. Ok I liked Super Jeopardy, pen and paper the answers and replay to win, good times. Excitebike will be my next game... does it have an end screen? I remember just getting high scores. Finally! THis was one of the harder Konami games I’ve beaten. Even with its unfair deaths and simplistic game play, I really enjoyed tackling this one. What stands out the most to me is the wonderful background art and the music. As far as Flintstones: Dino and Hoppy...I should first say I've been a longtime fan of the cartoons, and had dabbled in this game before, but hadn't really gone deep into it. That said, I almost wish I had left it alone, for a couple reasons. First, early in the game, it makes great use of its license, but the further you get into the game the further it strays from its source material. The second issue is the controls and more importantly how that relates to its game design. Fred controls a little loose and clunky, but you can argue that it keeps with the character of Fred Flintstone (should mention the sprite work for Fred is really nice). However, as you progress you reach more and more areas that require quick precise platforming, and this made for some extremely frustrating moments due to the clumsy controls. Several times I had to take a break to calm down after what felt like unfair deaths. I should reiterate, I didn't mind the controls (Fred Flintstone shouldn't control as crisp as Mega Man or Ryu Hayabusa), but the expectations in level design should match what the controls allow you to do. Unfortunately, the extreme level design kind of sucked out all the fun the further I got. As far as a recommendation, I still think it's not bad to dabble with a little (that's probably the Hanna-Barbera fan in me holding on to nostalgia), but it's definitely not worth taking the time to get good at. With that down, I'm finally going to make Ninja Gaiden 3 an official claim. I am way too close to the end of it (still have to get a little more consistent with the final level, especially section B), but at this point I have to see it through. Excellent day guys, that's a good bunch of titles you all knocked down. I started up AD&D Pools of Radiance today. Was pleasantly surprised at how much quicker it was to roll and build a team in this game than Wizardry and Bard's Tale were. I was actually playing the game in 15-20 minutes instead of 2 hours. But holy hell did it take me that full 2 hours to get a basic grasp on this one. Didn't understand how the combat worked for quite a while, couldn't figure out why my spell casters could do anything initially. Had to pull up a walkthrough for the items list because I wasn't sure what could be equipped to which character. Feel like I'm finally starting to get the hang of it though now and was able to very slowly, one battle at a time clear out the slums which was my first commission in the game. Now that I've got that done and have some decent equipment as well as a few levels under my belt I'm hoping I can make some good progress tomorrow night when I play again. The one thing I really like a lot better about this game compared to other early RPGs is that when you get loot, you get some fantastic freakin' loot. Getting +3 bows, crazy potions, Magic Rings, thousands of exp and gp. It's really awesome when you get some treasure. I went from scrounging my money to pay for the 5gp stay at the inn to ending my session with a bunch of badass equipment and nearly 20,000gp stored away. @Duke0619 - nicely done taking down Rush'n Attack! Golgo 13 is a pretty cool game. Have you played it before? @EZ Racer - Can't wait to cross Ninja Gaiden III of our list with you name next to it. Such a tough game. Yes, I love the game. I beat it when I was a kid and haven’t beaten it as an adult yet. It’s a game way ahead of its time. I’m looking forward to the challenge. started up AD&D Pools of Radiance today. Was pleasantly surprised at how much quicker it was to roll and build a team in this game than Wizardry and Bard's Tale were. I was actually playing the game in 15-20 minutes instead of 2 hours. But holy hell did it take me that full 2 hours to get a basic grasp on this one. Didn't understand how the combat worked for quite a while, couldn't figure out why my spell casters could do anything initially. Had to pull up a walkthrough for the items list because I wasn't sure what could be equipped to which character. Feel like I'm finally starting to get the hang of it though now and was able to very slowly, one battle at a time clear out the slums which was my first commission in the game. Now that I've got that done and have some decent equipment as well as a few levels under my belt I'm hoping I can make some good progress tomorrow night when I play again. The one thing I really like a lot better about this game compared to other early RPGs is that when you get loot, you get some fantastic freakin' loot. Getting +3 bows, crazy potions, Magic Rings, thousands of exp and gp. It's really awesome when you get some treasure. I went from scrounging my money to pay for the 5gp stay at the inn to ending my session with a bunch of badass equipment and nearly 20,000gp stored away. The Gold Box games are pretty weird for money. You always get more than you can use, and by the time you finish you will be a go-jillionaire (or something). On the 80's micros and DOS they were designed so that you could import your characters over from game to game, so ending the game with awesome levels and stuff made sense (though you couldn't always keep the stuff). What do you think about the combat? While I won't say that I prefer it to the DQ/FF system of the day, I do enjoy it quite a bit. The combat is growing on me. I hated it initially, but now that I understanding some of the nuance to it and ways to exploit it I'm enjoying it a lot more. For example there were a couple trolls and a group of lizard men I was definitely too weak to take out at my current level, but after a few tries I was able to sleep the lizard men in such a way that the trolls couldn't escape or hit me. Then it was many turns spent tossing arrows and slinging rocks at them both until they both fell and then I could pick off the remaining lizard men. I got to play some more tonight, but not quite as much as last night. Now that I understand the combat, have a few levels under my belt and am just in general more comfortable with the game I feel like I made some decent progress tonight and got 3 commissions beaten and opened up several new maps that I hadn't been able to reach last time. Not sure how big the game is or what the level cap is, but I feel like I put a good dent in both today. I really do love the rewards for tough battles or finding treasures in this game. They are so stingy with the exp/gp for regular fights, but the "boss" style battles really treat you well afterwards. Played a ton more Pool of Radiance tonight. Had to venture outside the city into the wilderness for a while so I didn't progress as much as I wanted to. Outside the city is much harder to navigate and if you're unlucky you'll get some crazy hard random encounters. I was able to knock off a few more commissions though and I know where to go for at least 3 more next session, just need to figure out which one would be ideal to tackle next. Hehe, you're making me want to play some Gold Box games, Crab. I'll have to go digging for my discs later. Finally (!) made it to the last level of Dirty Harry, and man is it brutal! After level one he levels get easier to navigate (level one is seriously one of the most confusing mazes I have ever been in) and linear. I finally can get past the dock area with ease, but I am having a bugger of a time with the cliffs. Arg! Going to step back for a moment and pick it up later tonight. So, I was not expecting to finish the game this soon but while at a friends house I beat the guardian legend. I did take a picture of the ending showing I beat it but now I got to go back and play the end again to record the end of the game for my channel. Im not bummed though, this game is a blast and almost want to play it from the beginning again. so much fun and I would recommend this game to anyone who loves things just a little different than your normal adventure game.